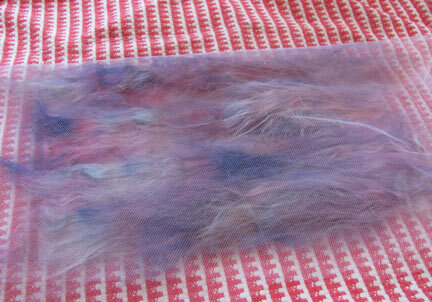 Ok, as I showed you last week, I wasn't too excited about using soy silk roving for needle felting. Although it worked, the fibers lost their luster, which just wasn't the look I wanted. My next attempt to use soy silk roving as a background for beadwork led me to a technique called Silk Fusion, or Silk Paper. 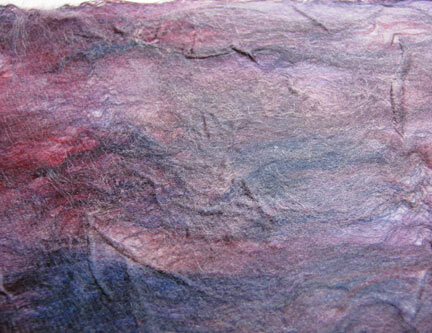 According to the folks at Treenway Silks (who have an excellent tutorial, by the way), using silk in felting goes back to 1989 to a felter in Holland named Inge Evers. The idea has been expanded upon and passed about extensively now, and you can find instructions all over the place. 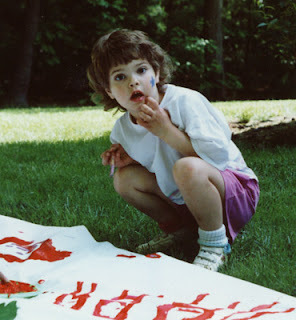 The first time I came across silk fusion was in Susan Stein's book Fabric Art Workshop . 1. The fibers need to be pulled from the hank and laid out on a piece of netting. With more netting folded over the top, the fibers are moistened thoroughly. 2. After squeezing out the excess water, some sort of polymer medium is added to the fibers. Some folks like textile medium, some use regular polymer medium thinned with water. I used Golden's GAC 100: it's thin and flexible, and is used for making glazes, so I didn't think it would interfere with the sheen of the fibers. Drizzle it on and spread it out with a foam brush. Don't use too much. You'll need to experiment a bit to see what product you like best and how much is needed. 3. The fiber sandwich needs to be set aside to dry thoroughly overnight. When it is dry, the netting will just peel right off without pulling fibers with it. As a final step, I chose to iron my new fabric with a low iron. 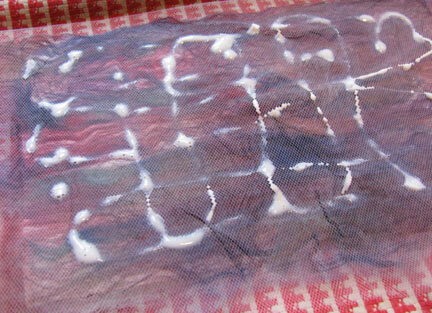 Some textile mediums must be heat set anyway, but I feel that even if yours doesn't, it will help the fibers to all stick together a bit better to heat them. Wow, that looks great Cyndi... I was a bit dubious when you left the netting on there with the medium... glad to know it peels right off... and the look is wonderful! Cyndi, received my beads yesterday! Thank you so so so much. The texture you get from this looks great! Sandi, I'm so glad you like them! Tammy, the luster really does look a lot like silk...I'm very pleased with the results!